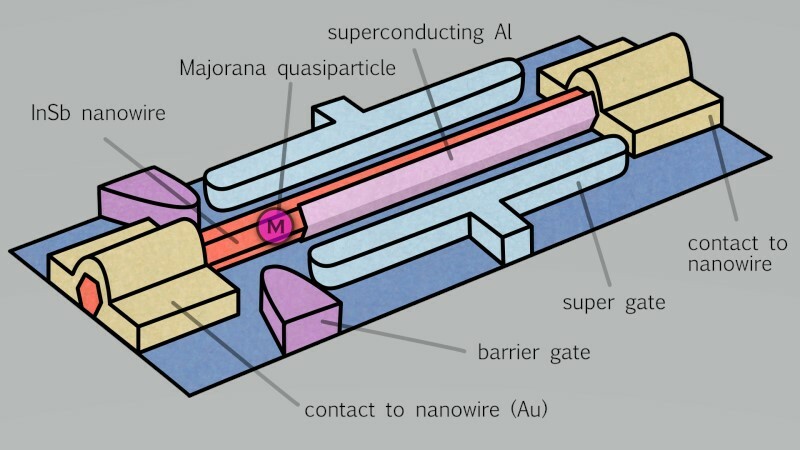 Researchers at QuTech, Microsoft, UCSB, JQI, and TU Eindhoven have published the results of an experiment that appears to confirm the existence of the Majorana quasiparticle. This quasiparticle would be the basis of a topological qubit that Microsoft and its partners are working hard to develop and its advantage would be an improvement in qubit coherence by several orders of magnitude. There is still much work that needs to be done to demonstrate functionality for a quantum computer. The next step involves fabricating four of these devices in a pattern to demonstrate braiding. And after that, implementing one-qubit and two-qubit gates to allow the processing of various quantum algorithms. Generally, the two-qubit gates are the hardest ones to implement and in many cases are the limiting factor for overall reliability in a quantum computer. For more details, you can view the abstract of the paper published in Nature here and you can view a blog article on the QuTech web site here.